There’s no denying the fact that bronzed skin gives you a healthier and more attractive look. However, is sun tanning really worth the risk? It certainly isn’t as your health is far more important. However, the good news is that today you can get a beautiful tan without endangering your health. Why there is no such thing as ‘Safe Tanning under the Sun’? Sun tanning is dangerous because of UV radiation. The fact that UV damage increases the risk of cancer has been proven yet again in the study published in Journal of Epidemiology in 2018. That’s not even to mention that exposure to ultraviolet radiation speeds up the aging process. Tanning beds are actually worse in this regard. American Academy of Dermatology warns that using those beds increases your risk of developing deadly melanoma by 59%. Skin Cancer Foundation also adds to the horror by stating that 1 in 5 Americans will have some type of skin cancer after 70. Exposure to UV rays is one of the main factors that make these statistics so alarming. You’ll be surprised to know that even top-quality sunscreen don’t give you 100% protection. The best you can do to protect yourself is to avoid UV exposure as much as possible. And when it’s not possible, you’ll need to use sunscreen with SPF50+ and reapply it every couple of hours spent outdoors. Today you can have beautifully bronzed skin in any shade without the risk of skin cancer attached. To achieve this result, you’ll need to find tanning products that suit you best. There are hundreds of ‘fake tan’ products available on the market, so you’ll definitely find a perfect fit. Lotions and creams are the most popular kind of ‘tan in a bottle’. They are safe, convenient, and easy to use. 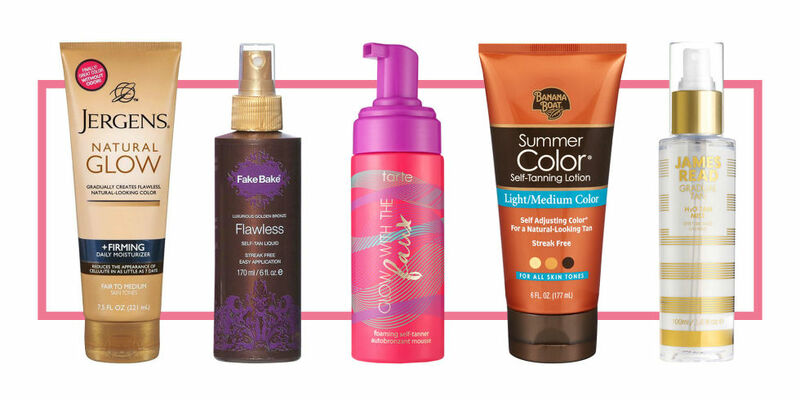 The majority of tanning products are also moisturizers or might even offer additional benefits to skin. Bear in mind that these products differ in formulas. Therefore, there’s a risk of developing an allergic reaction to some of them, especially if you have sensitive skin. That’s why it’s essential to check the list of ingredients and perform a patch test before applying the cream/lotion. Fake spray tans are another quick and safe tanning option. Today spray tanning salons are very popular, so there should be a few near you already. As the product is applied with an airbrush, you get a smooth and even result, which looks very natural. However, be sure to ask about the ingredients in the product as some of these sprays aren’t the healthiest kind. Your best bet is short duration tan sprays. While, they last for about four to seven days, they are safest, healthiest and smoothest of the lot. You will also need to ensure that the person performing the application is experienced and can provide an even and beautiful safe tan. Lastly, before applying any self-tanner product or going in for a spray tan, make sure to cleanse, exfoliate and moisturize your skin well, so you know you know you’re working with a smooth surface.